My computer went and broke itself. (How dare it, right?) It's with the computer nerds-for-hire (hopefully) being fixed. Meanwhile it's rather tedious to peck out long posts on my iPod, so we're going to do some exploring in the drafts folder. I hope you enjoy this bit of birthday fluff. Like many a child, Eddie is a lover of Lego. When it came time to pick a birthday party theme he deliberated for roughly a nanosecond before picking Lego. So Lego it was. My personal rules for young kid parties are: keep it small (you get to invite as many friends as you are old, so Eddie invited five), inexpensive, and busy. Keep those shorties occupied! I make no claims to being a brilliant party planner. You'll find no sunlit photographs of beautiful dessert tables worthy of an Ohdeedoh feature here. 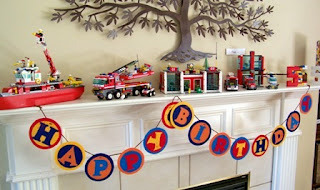 I just figure that someone else may be looking to throw a DIY Lego-themed party for a preschooler and might appreciate some inspiration. If so, read on! 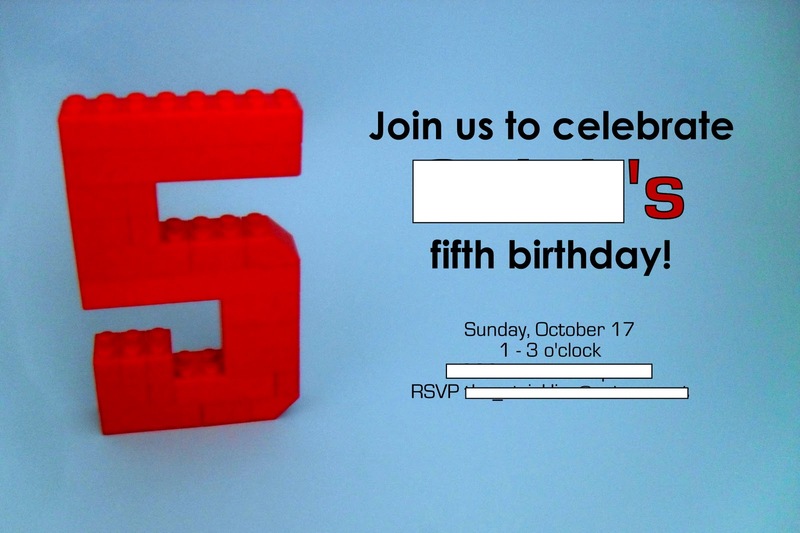 For the invitations, Eddie and Todd built a "5" from Lego bricks. I photographed it against some blue paper, added text and printed it out on cardstock. We reused the 5 on the cake at his birthday dinner. Eddie took it on himself to provide most of the decorations. He spent days making Lego creations to display. 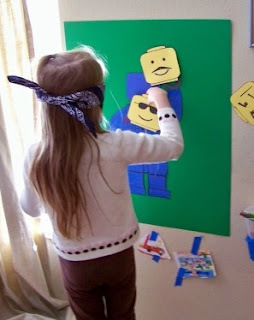 He also drew a bunch of Lego-esque pictures and cut out pictures of Legos from toy catalogs that he hung around the room using an absurd amount of tape. The goody bags were basic yellow paper sacks decorated with black and yellow cardstock to look like Lego minifig heads. We made them ourselves based on the bags from this Etsy seller. We kept the insides simple and preschooler-friendly: gummi bears, stickers, some candies we found at a local candy store that look like Lego bricks (you can actually build with them), and Lego crayons from Scribblers. I can't say enough good things about Julie from Scribblers. I emailed her three days before the party (hello, procrastination) and she had them in my mailbox in two days. 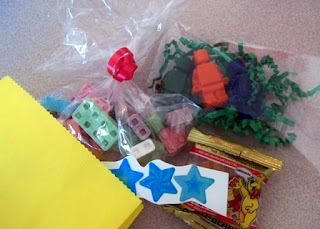 She'll include the cello bags and filling separately if you'd like, too, so you can package them up with other items. We had two Lego tables out for the kids to play with as they arrived. For the next game, the kids went back to the Lego tables and each built a small car. Since we were working with little kids, we already had sets of wheels attached to flat panels to save time. The kids just had to build on top of the panels. We did a little show-and-tell with each child showing off their car creation. Our very-'70s stairway banister is like a wide, flat ramp, so we used it as a jump for the cars, with a prize going to the cars that landed farthest from and closest to the stairs. I couldn't manage to crop the faces out of any of the pictures of this game, so you'll have to take my word for it that it was a good time. The kids especially enjoyed the show-and-tell and watching the cars fly off of the banister. The night before we cut out heads, torsos, legs, hands, hats and hair and put out the usual crafty suspects (crayons, glue, stickers, sequins, pom poms, etc.). 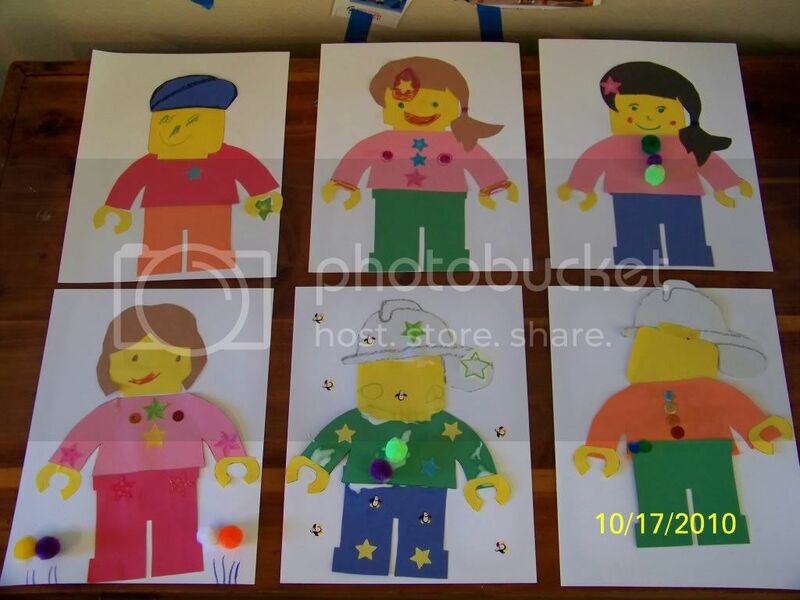 Everyone made their own Lego person collage to take home. We opened presents, then headed back to the table for cake and ice cream. There are some cutie cute Lego cakes out there. But preschoolers just care about eating the cake and they wiggle wiggle wiggle while waiting for a cake to be cut, so we stuck with cupcakes. Almost done! It was a sunny day, so they ran free in the backyard until it was time for their parents to pick them up. 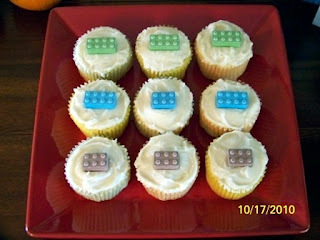 There you have it, an easy-peasy two-hour Lego birthday party! 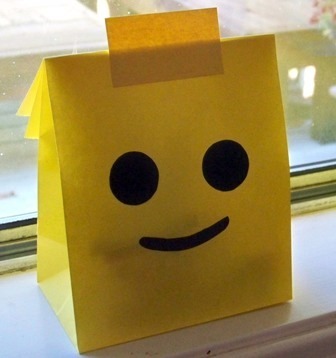 That's fantastic, I especially love the goody bags and the head on the minifig game. I LOVE IT! I loved legos growing up. That is a great idea. Maybe I will have a lego party for my birthday this year! So creative even down to the lego shaped candy! It must have been a blast. Wow, love it. DS is only 3 (just) but might have to come back to this one in a few years! A practical question: a friend of mine also suggested the 'number of friends that they are years old'. Thing is, how do you manage reciprocation of others' invitations? We're having two kids (closest friends: we also happen to like the parents a lot) over for DS's 3rd birthday and I might do a more casual larger playdate in the summer when there's better weather. I feel guilty about not doing the big party for multiple kids as others seem to and we aren't returning invitations. @Elly - You know, it hasn't been a big deal so far. E actually wasn't invited to the parties of three of the kids who attended his party (two of them had all-girl parties, so...). But we also haven't hit the elementary school stage yet, which is when I think the birthday party thing becomes a bigger deal among kids. (I still remember using 'I'm not inviting you to my party' as a playground threat. Ugh.) 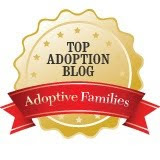 It hasn't caused any tension among my parent friends; I think everyone understands that different families will do different things. It's been a topic of conversation at playgroup before. Not all kids would even enjoy having a big party. So there's no expectation that birthday invitations will be reciprocated. Our family does small birthdays but hosts playgroups and summer BBQs and that sort of thing, so maybe it all just evens out in the end? I LOVE LOVE LOVE your great party ideas! Makes me want to have another lego party. 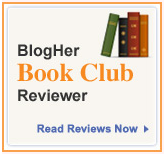 I'm featuring you on my blog Flexible Dreams today. Stop by to check it out and pick up your feature button! Thanks for the response, Heather. Maybe it's more my worry than anyone elses. I just ordered some of the multi-layer crayons for his upcoming (small) party. They're really cute. OMG, my oldest niece has just gotten into legos (if we define getting into legos as constantly telling me what to build but not actually doing much building herself) and this would be a welcome break from princess parties (for me). Book marking this for future use. So awesome!!! 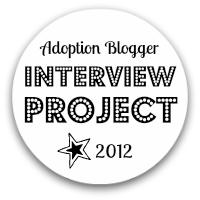 My daughter's 3rd birthday is in August, I am totally bookmarking this! Where are those Lego tables from? @Andrea - My dad built them for us. Aren't they great? I was wondering where you found the shapes for the bodies that you used for your craft? Thos elook really good and it's a great way to entertain the kids! 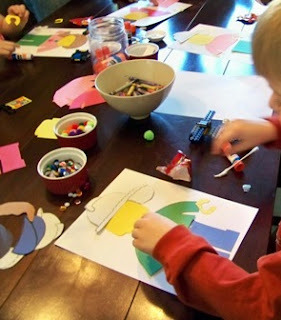 I was wondering where you got the shapes that you used for the Lego bodies in your craft? They look great!